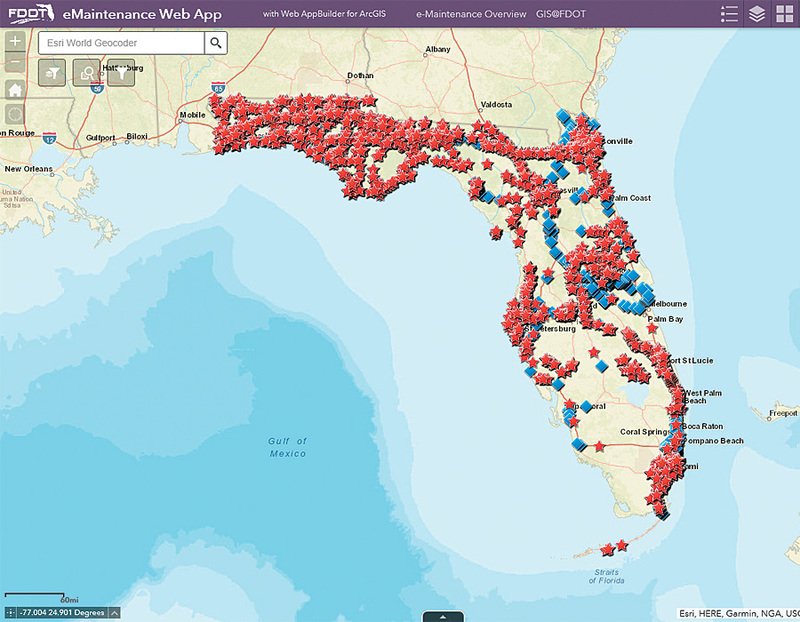 With FDOT’s public-facing eMaintenance Web App, anyone can see inspection results for crash cushions and guardrails across the state of Florida. Traditional transportation networks and accessible technology have evolved to the point that they are now intertwined and inseparable. As technology continues to advance and transportation systems begin to bring in more big data, departments of transportation need to assess—and potentially change—the cultures they have developed around technology. At the Florida Department of Transportation (FDOT), we have examined the way we collect, govern, and use data and technology in our day-to-day operations and business obligations. Now, instead of trying to build our way out of challenges—which can be slow, expensive, and fleeting when talking about physical infrastructure—technology is a core agency strategy. This means that technology—and GIS in particular—always has a seat at the table at FDOT and is never an afterthought. FDOT is responsible for one of the largest and most extensive transportation systems in the country. Supporting more than 20 million residents and over 100 million visitors annually, Florida’s transportation network includes 15 seaports and 2,890 miles of navigable waterways, 2,895 miles of rail line, 122,659 centerline miles of public roadways with 12,262 bridges, 779 airports, 2 spaceports with 10 launch facilities, and 31 urban transit systems. With assistance from developing technologies, each aspect of Florida’s transportation system produces data—and a lot of it. How to best use and manage this growing amount of data became an important point when discussing the intersection of transportation and technology. But FDOT had always assessed, planned, and financed transportation and internal technology initiatives separately. Because of this, transportation technology was not being funded appropriately, even though the nature of transportation development was inherently growing more technology oriented. This disconnect placed the agency responsible for shaping the transportation of the nation’s fourth-largest economy at a serious disadvantage and risk of falling behind in terms of growth and innovation. To meet the challenges that both big data and emerging technology were posing to Florida’s transportation systems, FDOT established its aptly named ROADS initiative, which stands for Reliable, Organized, and Accurate Data Sharing, in early 2015. Its goal was to create and implement an integrated enterprise information management system. The agencywide movement set out to ensure that FDOT’s current and future data is accurate, secure, and reliable in the hopes that it can empower employees to perform their jobs at an even higher caliber. With improved internal communication, data collection, and storage, FDOT’s employees and stakeholders can more efficiently and reliably access relevant business data and share it across the department. Around the same time that we launched the ROADS initiative, the Federal Highway Administration (FHWA) had also begun issuing national guidelines and standards on data governance to all state transportation entities. The aim was for departments of transportation to organize and implement an institutionalized set of policies, procedures, structures, roles, and responsibilities when it came to managing data and information. From these guidelines, we began exploring the concept of civil integrated management (CIM) in relation to FDOT’s own business practices. With CIM, the idea is to collect, organize, and manage data related to highways, bridges, and other transportation assets using a single, authoritative source that offers standardization and easy access to users. Alongside FDOT’s ROADS initiative and through the conceptual exploration of CIM, the agency also established the Office of Transportation Technology (OTT) in 2016. This formally solidified the relationship between key transportation technologies and the funding for transportation infrastructure. OTT required a groundbreaking internal reorganization that resulted in the newly established office that houses FDOT’s Information Technology division and the recently formed Office of Civil Integrated Management, named for and focused on the same data governance principles implemented by FHWA. Our implementation of CIM included getting an independent assessment of FDOT’s information technology capabilities, personnel, and infrastructure. The critical evaluation identified that we had a fundamental disconnect between transportation initiatives and technology plans. Like the allocated funding, the strategic plans for transportation business were developed and considered separately from the agency’s technology business. Isolating the two hindered our potential and limited how well FDOT could prepare for the cultural changes that were already occurring and poised to do more. Based on these results, FDOT elevated the data governance and planning discussions it was already having and began to modernize the way it does business. With the implementation of ROADS, CIM, and OTT, FDOT started integrating technology initiatives and transportation planning in a way that is organically tied to its daily business processes. Suddenly, technology was no longer a footnote. And with the aid of GIS, we have built a new culture at FDOT for how we integrate technology with transportation assessment and planning. The department’s Office of Maintenance provides a prime example of how this transformation has gone. Until recently, FDOT employees used clipboards, paper, and pens to record the condition of various transportation facilities out in the field. The physical reports then had to go through a lengthy data entry process before being collated into reports required by FHWA. But with mobile GIS technology, such as Collector for ArcGIS, employees in the field can now record all necessary information digitally, on the spot, and share the data with others throughout the organization. Having cut down on turnaround time and made this data easier to retrieve, the director of the Maintenance Office is now able to compile FHWA-required annual reports in a matter of minutes. Previously, this would have taken weeks. The changes we have made to data management and governance at FDOT—which we maximize by using GIS—save time and money. On top of that, they are also making it possible for us to sustain this increased efficiency and greater transparency. 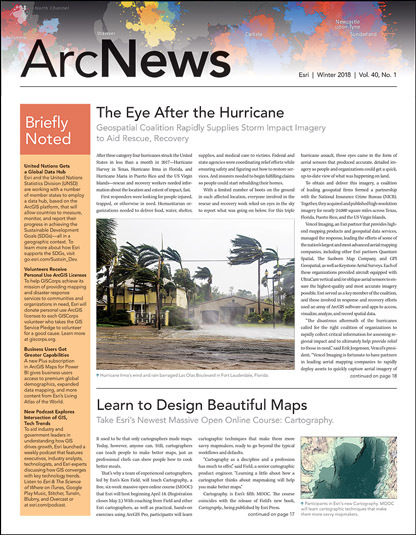 For example, we implemented ArcGIS Server to support the agency’s electronic document management system, and now employees can easily combine business plans and related documents (design plans, contract information, project financials, and more) to create visual presentations. Decision-makers throughout the department use these resources to guide teams and assist with planning. And the success of our technological initiatives has driven demand for accessible and transparent data solutions at all levels of the department. As more people have started using GIS over the last few years, the number of ArcGIS Online users at FDOT has quadrupled. None of this would be a reality, however, if we hadn’t implemented a new vision for data governance. Now, the CIM concepts adopted by the agency, together with the increased integration of GIS, have revolutionized the way FDOT does business. Because we have enhanced the relationship between technology and transportation from an institutional perspective, we now have room to innovate and are prepared to handle the big data that is starting—and will only continue—to come down the pipeline. Any state agency can do this. It just might require changing the prevailing business culture so that it’s centered on technology rather than being inattentive to it. April Blackburn, PMP, is the chief of transportation technology at FDOT, where she is responsible for aligning information technology with operational technology. Lydia Mansfield is a GIS mapping analyst at FDOT. For more information about how the agency has prepared to take on big data, email Blackburn at april.blackburn@fdot.state.fl.us or visit FDOT’s website.